Osaka may not look like it, but its metropolitan gross domestic product actually puts it on top with all the other global cities – Tokyo, New York, Paris, London – that make the world shiver with cold when they sneeze. It may not have the cultural endowment and traditional grace of Kyoto, but it does have enough GDP clout to be considered the economic command centre of Japan and Asia. With globs of yen at its disposal, you may suspect that finding cheap hotels in Osaka, Japan would be an exercise in futility, but if you look closer, you will not only find clean and affordable guest houses, inns, ryokan and hostels in Osaka, you will also delight in its yummier side as Japan’s food basket. 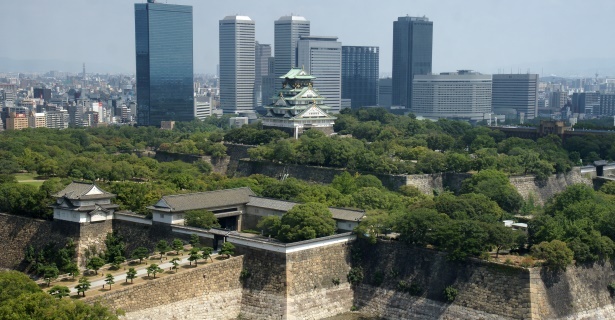 Osaka’s lack of historical monuments and imperial splendor can all be attributed to the bombs of WWII that left it in rubble. But the thick forest of glistening hotels in Osaka Japan, soaring office towers and blocks of utilitarian but otherwise bland structures of concrete that rose after the war hides the humongous headquarters of global movers and shakers in electronics – Panasonic, Sharp and Sanyo are just some of the big players in the industry that call Osaka home. Osaka’s legendary urban sprawl – home to at least 3.7 million working people by day and 2.6 million more at night – belies the fact that deep down where it matters – the stomach – it is “the nation’s kitchen.” Where you battle shrine fatigue in Kyoto or overcome the mass of men in Tokyo, in Osaka, you eat ‘til you burst. There’s even an Osaka saying to that effect: If you see any restaurant labeled “kuidaore,” you may be tempted to ‘eat to your financial ruin’. But okonomiyaki (pancake), takoyaki (octopus dumplings) and oshizushi (pressed rectilinear sushi) are all delicious whether eaten in a mom’s-cooking shop in Dotonbori, or in an up market hotel in Osaka, Japan. Of course, you can also “shop to your ruin” in Osaka, and the best places to flash your yen are in Dotonbori, Namba and Shinsaibashi. Nipponbashi, or colloquially Den Den Town, is not only a hotspot for all things electronics, it is anime central with plenty of cosplaying maid cafes thrown in. Dotonbori is more famously known as the “kuidaore” central of Japan, while Namba, along with Umeda, Shin-Osaka and Kyobashi have some of the best hotels in Osaka, Japan. Recently, backpacker accommodation in Osaka has sprouted around the subways, particularly along Shin-Imamiya and Dobutsuen-mae stations in Tennoji. Elsewhere in Japan, “kabuki” may be the more mainstream form of theater, but “bunraku” or traditional puppet plays are distinctly Osakan. “Enka” (music resembling traditional styles) and “manzai” (straight-guy/funny-man standup comedy) are other forms of indigenous entertainment, but true to its reputation as a global city, classical music is alive and well in Osaka’s symphony halls and opera houses. Osaka has its fair share of cherry blossoms or “sakura” and you can come during the spring months when the fragile petals are abundant – and Osaka hotel deals scarce due to massive crowds. Osaka is blanketed with fairy floss come April, and the best places to take part in “hanami” or cherry blossom viewing are at the Kema Sakuranomiya Park, the Osaka Castle or the Osaka Mint Bureau. These hanami spots have thousands of blooming cherry trees or hundreds of trees that come in a hundred, dizzying varieties.